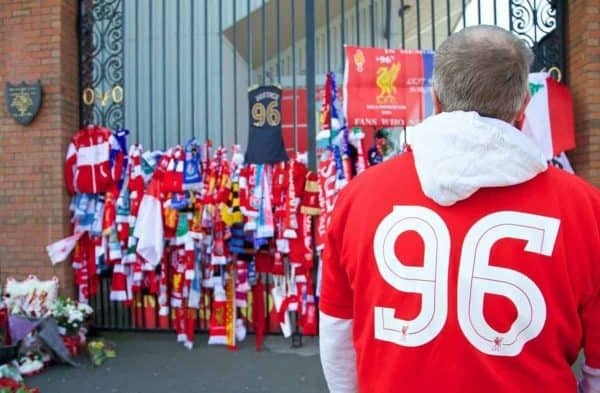 Liverpool will mark the 29th anniversary of the Hillsborough tragedy with a minute’s applause and special ’96’ mosaic at Saturday’s home match against Bournemouth. Tributes will be paid at Anfield 24 hours before the actual anniversary as the club do not play games on April 15. The victims’ families have requested applause rather than silence to not only remember those who died at the FA Cup semi-final in 1989, but also to recognise the achievements of the families, survivors, fans and all those who have supported the campaign for justice. Fans on the Kop will reveal a special ‘96’ mosaic, players will wear black armbands, tributes will be displayed on the pitch’s LED perimeter boards and there will also be a commemorative edition of the matchday programme. On Sunday the club’s players and staff will observe a minute’s silence at 3.06pm. Next year’s 30th anniversary will be marked by a special memorial service at Anfield, as requested by the Hillsborough Family Support Group.